On Wednesday evening, the candidates for the 2003-2004 Undergraduate Association president and vice president met in the student center lobby for this election’s debate. A new name and a new schedule for dormitory rush will greet the Class of 2007. Professor J. Kim Vandiver addressed a sparse crowd of MIT faculty, staff, and students as part of a Committee on Community “briefing” in 10-250 last night. 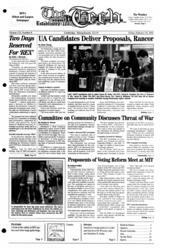 The committee is sponsoring the “Community Briefings” to help preserve freedom of expression at MIT during times of increased international tension. With memories of late 2000 Florida and other election nightmares fresh in their minds, voting reform leaders gathered at MIT to discuss a new proposal: instant runoff voting. Is the Administration Behaving Scientifically?